The flagship employment generation programme has yet again fallen short of funds, despite the fact that there was more work being demanded in the last two quarters. MGNREGS faced a shortfall of Rs 2,669 crore. The allocation for the scheme has increased to Rs 38,500 crore in the Union budget. It is more than Rs 3,800 from last year’s allocation, but the pending liability of the current year till February stood at Rs 6,470. This liability will be increased further in March. The pending liability shows that there is demand for work on the ground. If we reduce the current pending liability from the current allocation, it stands at Rs 32,030 crore, which is lesser than the allocations in the last four years. The fund squeeze in MGNREGS through pending liability is not new as the trend has continued from last three years, in UPA-II as well as the NDA regime. (See table.) Ending the year with pending liabilities means that workers’ wages remain unpaid. 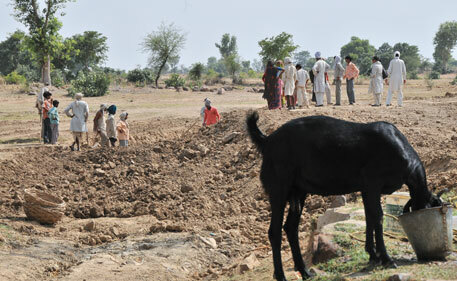 The government has proposed utilizing MNREGS for water harvesting in drought prone blocks. The budget has proposed 5 lakh farm ponds and wells in rain-fed areas and 10 lakh compost pits to produce organic manure. Every block under drought and rural distress will be taken up as an intensive block under the Deen Dayal Antyodaya Mission. The mission will converge MGNREGS to make the regions drought resilient by water harvesting and self help groups (SHG) will engage the poor in income generation and help increase rural income. In order to improve rural spending, the government has increased the total allocation by 22 per cent. Last year, the total rural development spending was Rs 71,695 crore, which has been increased to Rs 87,765 crore. The allocation under Pradhan Mantri Gram Sadak Yojana increased to ` Rs 19,000 crore. This will connect the remaining 65,000 eligible habitations by 2019. In a move to uplift local governance institutions, the government has also proposed Rs 655 crore for strengthening panchayati raj institutions (PRIs) under the Rashtriya Gram Swaraj Abhiyan. The Ministry of Panchayati Raj had become unviable after the budget was reduced to a mere Rs 94 crore last year.